The creamy flesh under the orange and red skin of Apple Blenheim Orange is nutty in flavour. Apple Blenheim Orange is a perfect accompaniment to cheese and cooks down to a stiff puree. We consider it the best dual purpose apple tree (both cooking and eating apple). 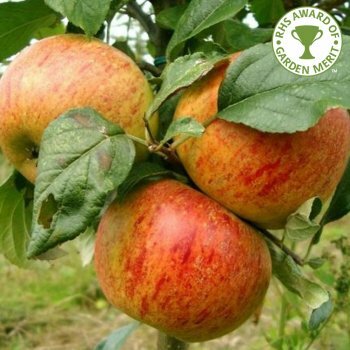 A tough variety Apple Blenheim Orange will cope well in less favourable and Northern positions. This delicious apple from Oxford in 1740 is certainly one of the best dual purpose apples available. Expect reliable crops of large colourful apples in early October. As a triploid Apple Blenheim Orange will require two other pollinators or one self fertile pollinator in groups A, B or C within a half mile radius. Blenheim Orange is a group B triploid apple tree and requires two suitable pollinators (or one self fertile pollinator) within a 1/2 mile radius. Apple trees should be spaced according to their rootstock, for example an MM106 (semi-vigorous) rootstock will require approx. 4.5 metres between trees, whereas an M27 (very dwarf) rootstock will require approx. 1.5 metres between trees.